Tag Archive | "condo for sale"
Three bedroom condo in one of the nest locations in Cuenca near the the Yanuncay River trail that runs all the way to Loja. The park has playground and exercise equipment and the trail is wonderful for hiking and biking. The condo is across the street from the Rio Yanuncay greenway and is close to shopping and a short taxi ride to El Centro. This condo in one of Cuenca’s nicest condominium projects. 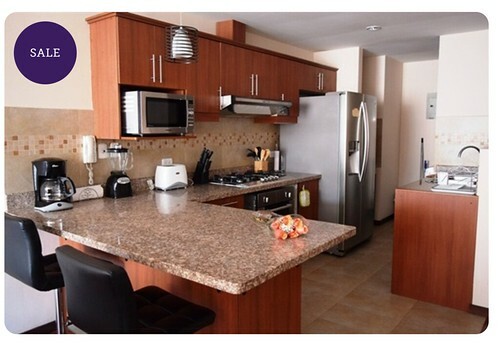 The condo is fully furnished and equipped including dishwasher and washer – dryer. This is a 3-bedroom apartment. There is a social area outside the bedrooms. The property has 1,300 square feet with three bedrooms, three bathrooms and a garage. 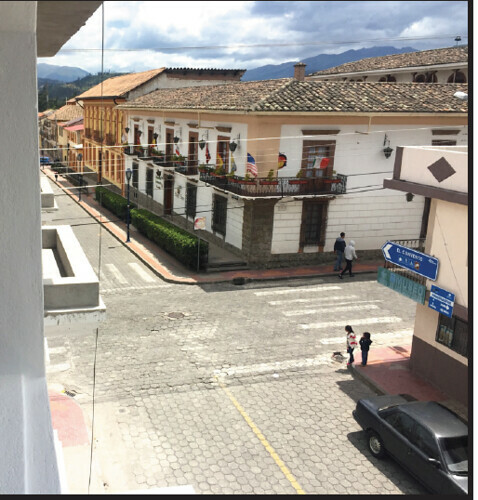 A condo for sale in Cotacachi Ecuador is explained in the note below from our Ecuador friend and attorney Dr. Andres Cordova. MOUNTAIN VIEWS. The list price for this condo is $92,895, but because Gary does not accept commissions on the sale of real estate listed at his site, I am able to offer this until April 1st 2017 at just $84,895. This is a remarkable opportunity with special pricing. You can reserve it now. I do not think this opportunity will last long. 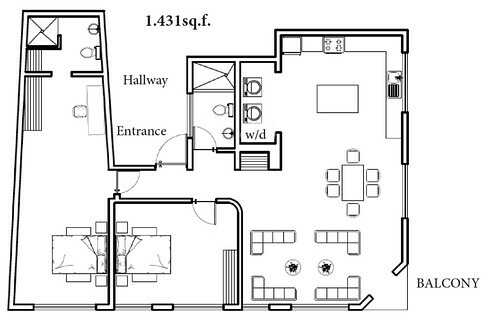 Here is the floor plan for the 1,431 square foot, two bedroom condo for sale in Cotacachi. 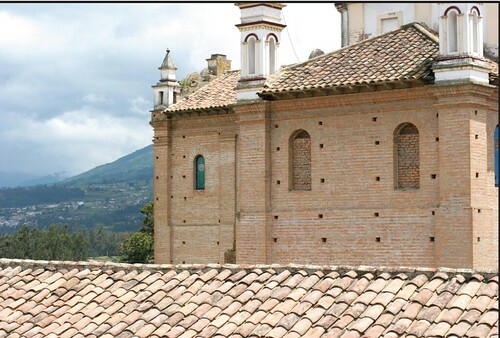 This condo is next to this Cathederal and the main plaza in Cotacachi. 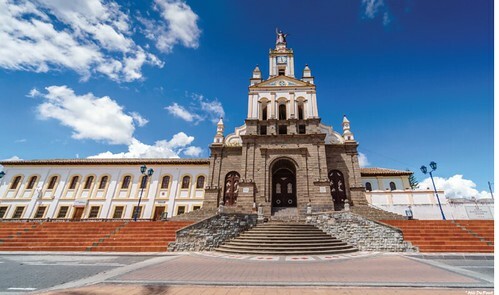 This town is deemed to be among the nicest and most sought after retirement destinations in Ecuador. Whether as your new part time or permanent home or as an investment, this is a one-of-a-kind opportunity. This is the wonderful city and mountain views from the 3rd floor. This unique corner unit enjoys views of the city of Cotacachi and the wonderful mountain landscapes that surround it. mountains, you will find deep inspiration in this condo. centuries-old cathedral, markets, museums, shops and more. 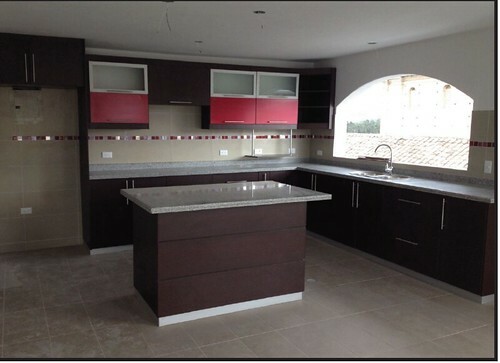 The picture to the left was taken before a beautiful tile floor was laid. It depicts the living room, which has exceptional views and a balcony access. 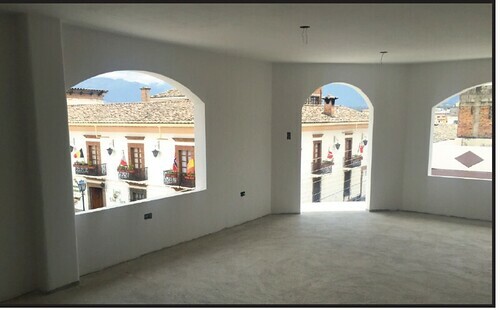 The condo is part of the renovation of a beautiful 3-story corner building, with great curb appeal in the heart of Cotacachi. This picture was taken from one of the windows in the living room scheduled for completion in two weeks. The facade has garden sills for hanging gardens. An ample, modern kitchen will greet you. It will be perfect for entertaining family and friends, with wonderful unobstructed views. put a BBQ and other amenities there. On the very top, a detail of the Cathedral, seen from the kitchen window. 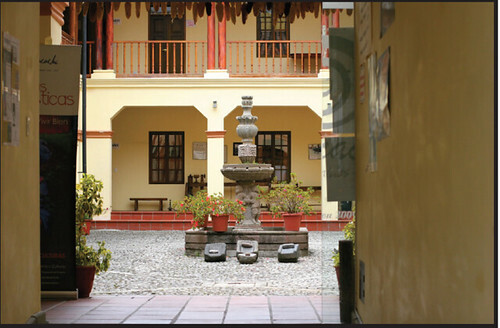 Above, a beautiful inner patio Courtyard in Cotacachi Museum across the street from the condo. This street, is just a few steps from the condo. There are several people interested in renting the condo if you wish to rent rather than live in it. This is a great investment that can also allow you rental income. 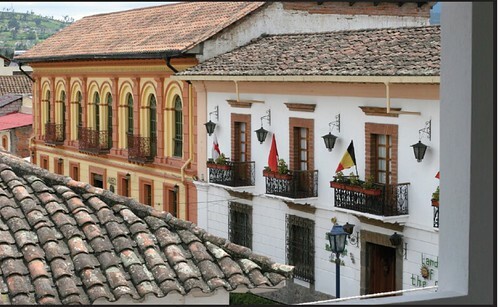 Cotacachi is located 65 miles to the north of Quito, via a modern highway system. 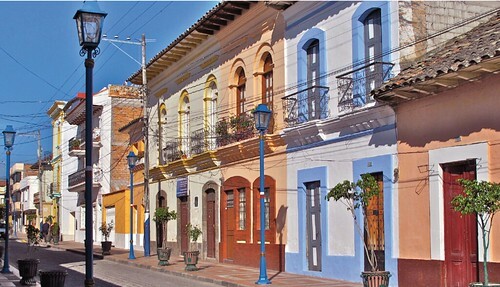 It is a cozy artisan city of approximately 40,000 inhabitants, renowned for its leather goods and handicrafts. In 2000 it was declared an Ecological County and 2002 it was designated as a City of Peace by UNESCO. 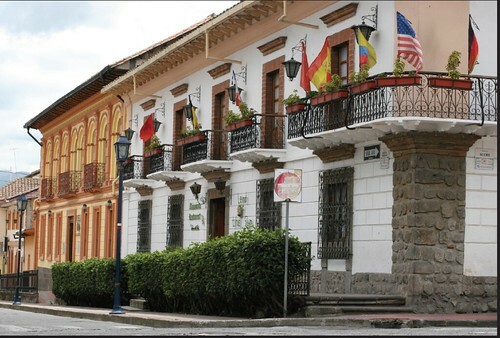 Cotacachi is blessed by a wonderful natural and cultural landscape. 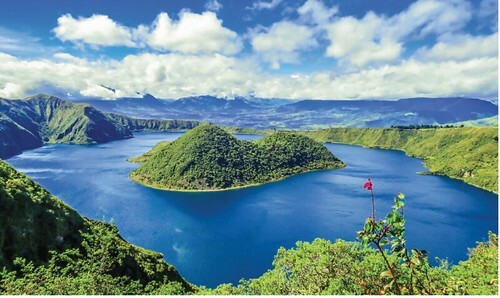 This is crater-lake Cuicocha, a stunning scene. 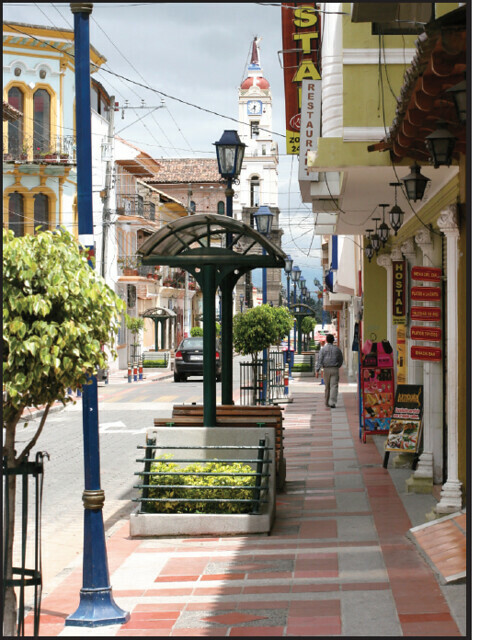 It lies a few minutes away from Cotacachi. It has hiking and bicycle trails, as well as restaurants and handicraft. 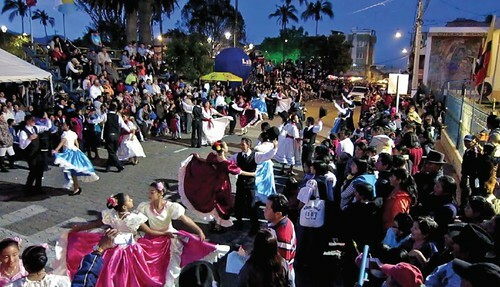 This is an evening festival in the plaza of Cotacachi just a block from the condo! What are you waiting for? The wonderful condo can be yours for $84,895. This is an extraordinary price; an opportunity that will not last long. You can reserve it with $5.000. This reservation freezes the price and generates a commitment from each side as the closing is coordinated.